Kosovo-Holidays: Why go to Kosovo? "Kosovo is in our heads because of the war in 1999 and the NATO bombing campaign on Serbia when it refused to accept Kosovo's Independence in that year. Ultimately, Kosovo gained independence ( in most people's eyes) in 2008 making it Europe's newest country. I wanted to see what it looked like. I hoped and expected to find a 'normal' county with 'normal' people doing 'normal' things. And I did. 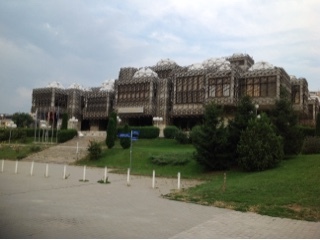 I went to the Enthnologocal museum and had a long chat with the curator who was quite upbeat about Kosovo's future. More than 50% of the countries population is under 25, which bodes well for the future. So, little Kosovo (you can ride across it in about an hour) used to belong to Yugoslavia and Orthodox Christian Serbia refuses to recognise it. 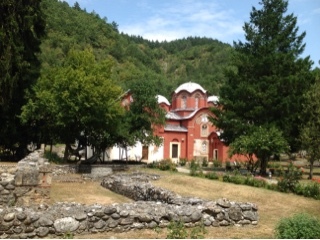 So it's a little weird that the tourist highlights of Muslim Kosovo are two Orthodox Serbian Monastery's protected by NATO. We had to hand in our passports to visit. The 20 or so nuns in the first one and 25 monks in the second one live in almost total isolation as the local populations want them to leave. My final stop was also the highlight. Lovely little Pritzen. Kosovo's third largest town ( 180,000 people) It had a river, a castle, churches, mosques, coffee shops and when we were there, an eight day film festival. Prizen was also the place where I've seen my first ( for 10 minutes!) rain on the whole trip! So there you have it. Kosovo. Just a regular place full of people trying to get on with life."